The University of Western Ontario (known as Western, as well as UWO or Western Ontario) is a public research university located in London, Ontario. 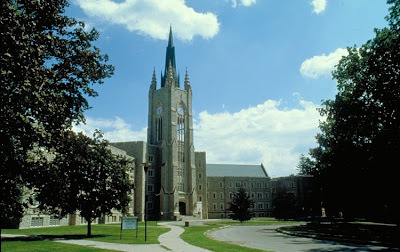 It is one of Canada's oldest universities, founded in 1878 by Bishop Isaac Hellmuth and the Anglican Diocese of Huron as The Western University of London Ontario. Huron College, established in 1863 as an Anglican theological school, provided the basis for the new university. The University covers 1.6 km² of land on the north branch of the Thames River and the main campus consists of 75 buildings. The university also has extensive land holdings outside of the main campus. The school colours are purple and white, and the school's motto is Veritas et utilitas, meaning Truth and usefulness. The University's Chancellor is Arthur Labatt, and its President is Dr. Paul Davenport. Through its twelve faculties and schools, and three affiliated colleges, the University offers more than 200 different degree and diploma programs. The University was founded in 1878 by Bishop Isaac Hellmuth of the Anglican Diocese of Huron as "The Western University of London Ontario. "It incorporated Huron University College, which had been founded in 1863.The first four faculties were Arts, Divinity, Law and Medicine, and there were originally only 15 students when classes began in 1881. The first of these students graduated in 1883. The Western University of London was eventually made non-denominational in 1908. In 1916, the current site of the University was purchased from the Kingsmill family, and in 1923 the Western University of London was renamed the University of Western Ontario. The first two buildings constructed at the new site were the Arts Building (now University College) and the Natural Science Building (now the Physics and Astronomy Building). These were built in a neo-Gothic or "Collegiate Gothic" style, and classes on the present site of the school began in 1924. 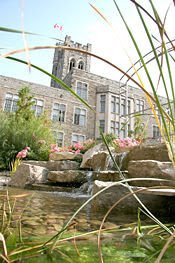 The University College tower, one of the most distinctive features of the University, was named the Middlesex Memorial Tower in honour of the men from Middlesex County who had fought in World War I (all 40 male students at Western in 1914 had enlisted). Western later became affiliated with St. Peter's College seminary of London, Ontario in 1939, and it eventually became King's College, an arts faculty. Although enrollment was relatively small for many years, the University began to increase greatly in size after World War II and by the 1970s, 10% of university students in Ontario were enrolled at Western. The University saw the addition of a number of new faculties in the post-war period, such as the Faculty of Graduate Studies (1947), the School of Business Administration (now the Richard Ivey School of Business) (1949), the Faculty of Engineering Science (now the Faculty of Engineering) (1957), the Faculty of Law (1959), and Althouse College for Education students (1963). 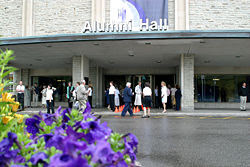 Other notable buildings on campus include Thames Hall (built in 1949), the Stevenson-Lawson Building (built in 1959), Middlesex College (with its clock tower, another distinctive feature of the university, built in 1960), Talbot College (built in 1966), Alumni Hall (built in 1967), London Health Sciences Centre University Hospital, the John P. Robarts Research Institute, the Lawson Health Research Institute, the D.B. Weldon Library, the John Labatt Visual Arts Centre, the Boundary Layer Wind Tunnel Laboratory, the University Community Centre, the Social Science Centre, and T.D. Waterhouse Stadium (built in 2001). The campus is also home to the Hume Cronyn Memorial Observatory, built in 1940 as one of the first observatories at a Canadian university, and named after the grandfather of actor Hume Cronyn. Engineering, Students can choose to specialize in the following disciplines: Chemical Engineering, Biochemical Engineering, Civil Engineering, Computer Engineering, Electrical Engineering, Integrated Engineering, Mechanical Engineering and Software Engineering. 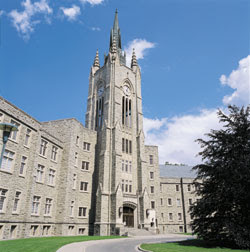 Brescia University College (Roman Catholic; the only university-level women's college in Canada), established in 1919 by the Ursuline Sisters. Western is one of Canada's leading universities,ranked #1 in the 2007 and 2005 Globe and Mail University Report Card for overall quality of education It ranked #3 among medical-doctoral level universities according to Maclean's Magazine 2005 University Rankings. In 2006, Western and many other universities refused to provide Maclean's with data due to concerns regarding the magazine's ranking methodology.In that year, it ranked #5 in the Medical-Doctoral category. Three of the four schools placed above Western in that year's ranking had also refused to participate. In the 2007 Maclean's rankings, Western dropped considerably to 7 out of 15 universities in the medical doctoral category. Western Ontario is among the world best universities, with great reputation throughout the world.